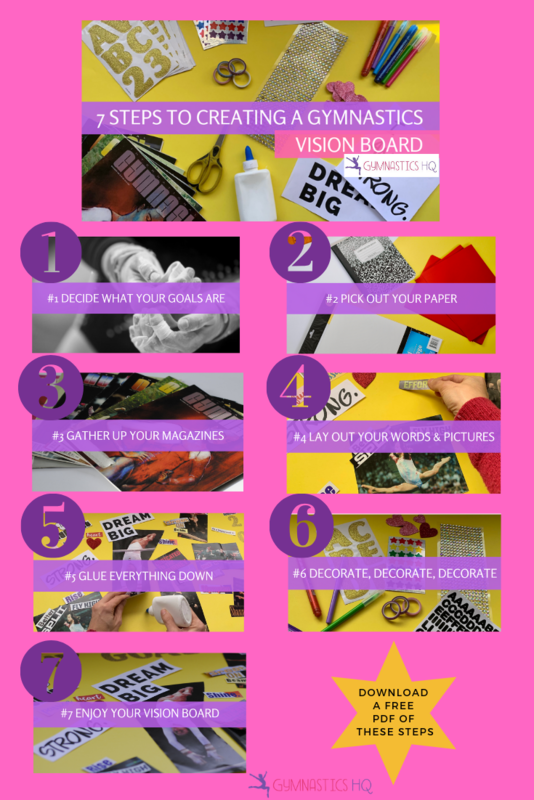 Have you heard about vision boards but aren’t really sure what they are or why you should create one? Are you wondering how vision boards can help you become a better gymnast? Do you wish someone could help you create your very own gymnastics vision board? Well, look no further, gymnast. You’ve landed in the right place! 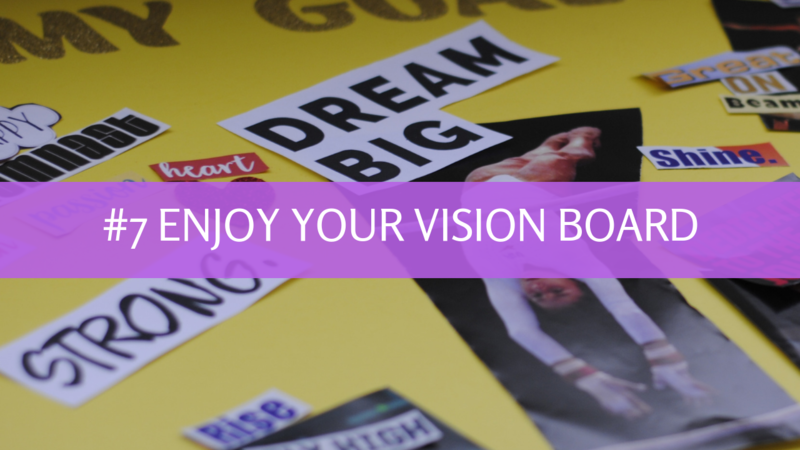 In this blog you’re going to learn step-by-step how to create a vision board for gymnastics. 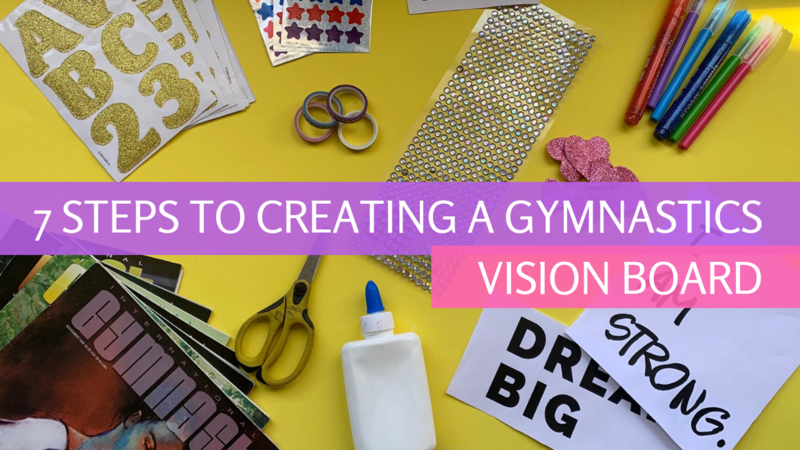 But first, read on to learn more about what a vision board is and why you absolutely NEED to create one for gymnastics now, regardless of your skill level! One of the most important things you can do as a gymnast is have a clear vision of your goals and dreams. This is important because it serves as a reminder for WHY you’re working so hard and helps to motivate you when you start to lose steam or wonder why you’re putting in so much effort when things feel tough. As a gymnast your competition season is long. It’s common to start losing motivation halfway through your season, if not before. 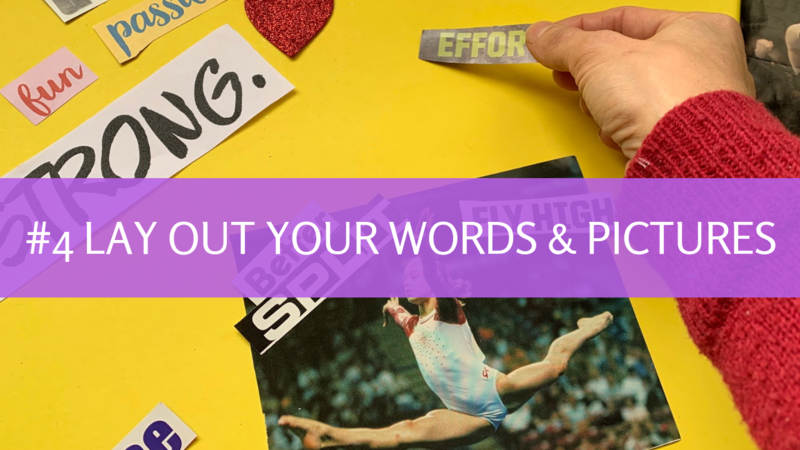 Even if you’re a gymnast with high levels of motivation, a vision board can remind you why you started and serve as a “pep talk” for when you really need one. It can also keep you motivated during the summer months when you’re learning new tricks and skills. Also true, a vision board can help you stay focused on your goals for the year, serving as a daily reminder of the things you want to improve on. You don’t have to be a high level gymnast to create a vision board! A vision board is also important for recreational gymnasts. Even if you don’t compete yet, you still have skills you want to learn or goals you hope to achieve in gymnastics. Maybe you want to learn that cartwheel you see your friends do or perhaps you want to be able to walk on your hands without falling? You might even dream of becoming a competitive gymnast some day. Creating a vision board, then, is an important tool for EVERY gymnast, regardless of skill level. A vision board is a visual representation of pictures and words that describe your goals. It can be as small or large as you want it to be. You can create one on posterboard, foam board, construction paper, or in your notebook. Some gymnasts even prefer to create one on their computer and print it out or set it as their desktop wallpaper. Others like to use a cork board or magnetic board to pin up their photos. Whatever the method, the goal is the same – to create one place that serves as a daily reminder of all your goals and dreams for the year. This incredible superpower of writing down your goals works for gymnasts too! Having something physical that you can see everyday will create impressions in your mind that will “trick” your mind into believing in bigger things. It’ll also help you gain more confidence as a gymnast. Before the Olympics in Beijing, then-18-year-old gymnast Nastia Liukin placed three images on her vision board: the Eiffel tower to symbolize a trip to France she wanted, a BMW and the 2008 gold medal. It’s clear that vision boards are powerful tools for achieving goals. And both Nastia and Gabby have proven how important vision boards have been to their success as gymnasts. 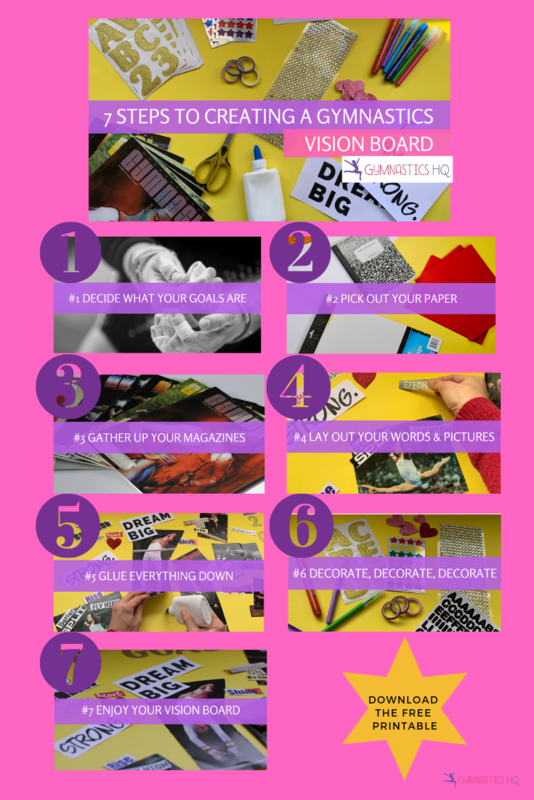 So if you haven’t created your OWN vision board then it’s time to jump on board and get moving! 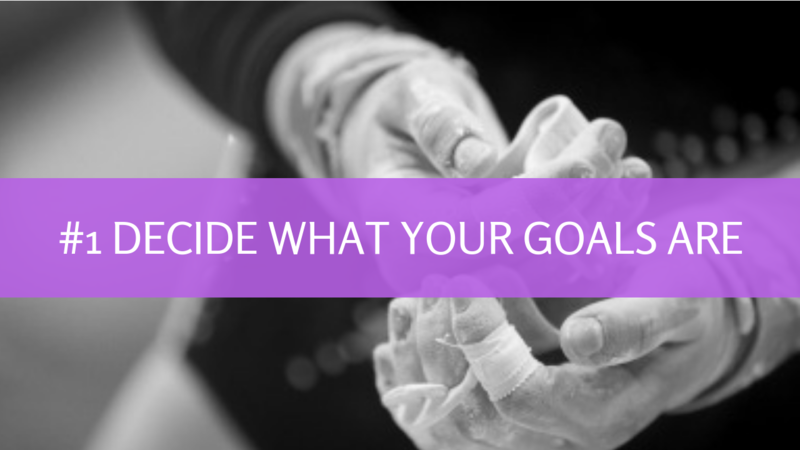 There is no better time than right NOW to create one for your gymnastics goals!!! Now that you’ve learned how powerful a vision board can be, let’s get to work. Below we’ve outlined the 7 Steps To Creating a Vision Board for Gymnastics. Follow along and complete each of the steps in order. If you’re a younger gymnast, ask your parents to help you. If you’re older, think about gathering your gymnastics friends together and having a vision board “party.” If you’re a coach, consider hosting a vision board night at the gym one weekend for all of your gymnasts. In fact, you can even create a group vision board with your teammates like the one the University of Utah’s Women’s Gymnastics team did in 2013. The possibilities are endless! The point is to make this a fun activity that you will look forward to completing every year. Step 1: Decide on your vision and goals for the year. It’s always a great idea to do a vision board at the beginning of the calendar year because it feels like a fresh start for many people. But you can also make one at the beginning of your gymnastics season or at ANY point during the year. Timing isn’t as important as the fact that you actually create your vision board. In order to get started, begin by thinking about some things you’d like to accomplish this year. Maybe there’s a new skill you want to learn (like a double full on floor), something you want to improve on (like your flexibility), or some big meet you’d like to qualify for (such as your State meet). Nothing is off limits for your vision board because this is YOURS and no one gets to tell you how big or small to dream. In addition to a list of goals, you should also think about ways you want to FEEL this year. Maybe you’d like to feel more confident or maybe you want gymnastics to feel fun again. Maybe happiness is a feeling you want to feel as when doing gymnastics. Its important to remember that the reason you want to achieve your goals and dreams in the first place is because you want to experience positive feelings like happiness, joy, fun, and confidence. So why not focus on these good feelings every day even BEFORE you’ve achieved these goals? It might feel like a backwards way to go about achieving your goals but what you’ll notice is that as you begin to think of these positive feelings everyday, you’ll start to achieve your goals!!! It’s amazing how this works. Vision boards are powerful tools! 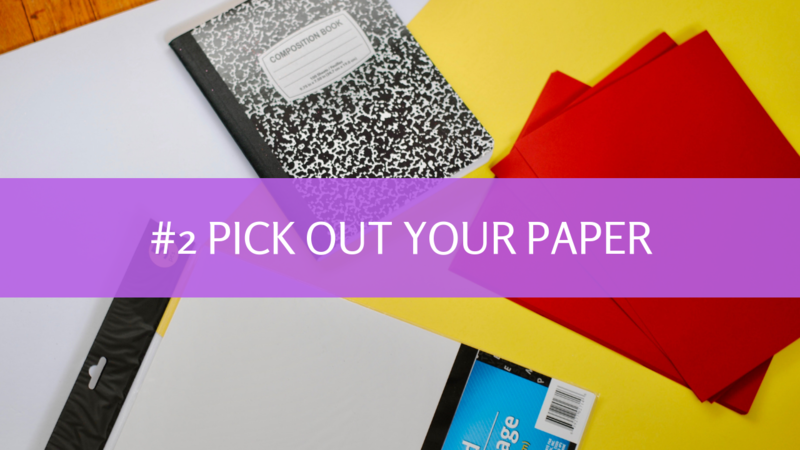 Step 2: Decide what kind of paper you’re going to use. It helps to think about where you’ll want to put your finished vision board. If you want to hang it up on a spot on your wall then find a piece of paper or poster board that fits your space. If you want to prop it up on your desk then opt for a heavier foam board that is sturdy and can stand up against the wall. If you have a gymnastics journal or tracker then you might want to create your vision board in the front pages of that journal so you can look at it daily as you write in your journal or track your skills. Where you put your vision board is a personal decision, however the goal is to make it something that you’ll see EVERYDAY! So decide on where you’ll be putting your vision board and then find the paper to fit. Step 3: Gather up your gymnastics magazines and photographs. 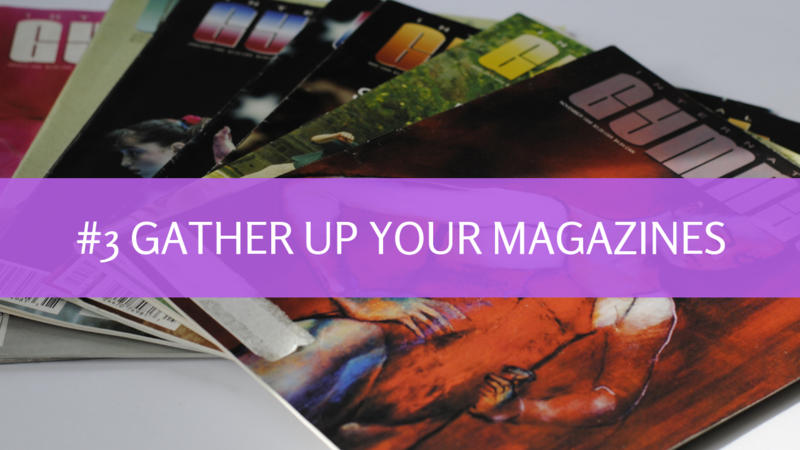 Now that you’ve decided on the type of paper you’ll be using, your next step is to gather up your gymnastics magazines and any other magazines that you can cut out words and images from. If you don’t have magazines or don’t want to cut from them, you can find images on the computer and print them out too. You can even ask your parents for their old magazines or the newspaper to cut out pictures and words from. You might also print out photos of yourself doing gymnastics or pictures of you and your friends having fun. The idea is that when you look at these photos and words you feel GOOD. This vision board should feel fun and make you smile! If a photo doesn’t feel right then don’t include it. Again, this is YOURS and will be unique to you so make sure you don’t compare your vision board to your friend’s vision board and add in the same things as her. YOU do YOU! You are allowed to dream up ANYTHING you want. Spend some time going through your magazines and cutting out these photos and words. If you can’t find the exact words you want, then cut out individual letters and form the words yourself. Step 4: Figure out the best layout of your pictures on your vision board. Now it’s time to start putting your vision board together. Before you glue down your pictures and words, be sure to lay out your images on top of your paper FIRST to decide on the best layout for your vision board. Spend some time rearranging and playing around with different arrangements. Put your most important goals in the middle of the board where they’ll catch your eye. Some gymnasts like to cover up all the blank space on their poster while others like to keep some space between pictures. Again, the choice is yours! Step 5: Glue everything down. Once you’ve figured out the best layout for your photos and words, you can then glue everything down. You can use a glue stick or Elmer’s glue (if using Elmer’s glue, remember to put on a small amount so you don’t have glue oozing out of the edges of the pictures!). One-by-one glue each of your pictures down. Don’t take all the pictures off before gluing or you’ll lose your layout! Step 6: Decorate your Vision Board. This is where the real fun begins! 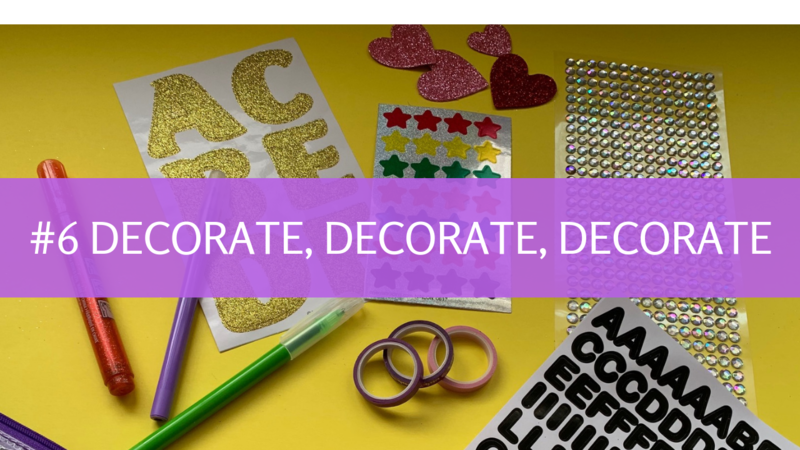 You can now “jazz” up your vision board with glitter glue and pens, pretty decorative tape, stickers, markers, or anything else you want to decorate your vision board with. Have fun with this and be creative. If you love glitter, add lots of glitter! If you love stickers, pile them on! The sky is the limit! Step 7: Hang your Vision Board Where You Will See It Everyday! Now that you’ve completed your vision board, it’s time to enjoy it! Find the best place to hang or rest it where you’ll see it every single day. You might put it on your desk, hang it over your bed, or put it behind your bedroom door. Play around with different places to see which one you like the most. You can even take a photo of your finished vision board and use this photo as the wallpaper on your phone or tablet. Again, the point is that you see your vision board daily. When looking at your vision board, spend a few minutes visualizing yourself achieving the goals and feelings you put on your board. If you put a photo of yourself on the 1st place podium then imagine what standing up on that podium would feel like to you. If you put words like “happy” or “accomplished” on your vision board think about what those words really mean to you. If you picked out a photo of a gymnast in a center split because you want to be more flexible this year, then imagine yourself sitting in your splits and how great it would feel to be at ease in your body while holding your splits. The visualization and the feelings MUST go together! Now that you’ve created a vision board for gymnastics, who says you have to stop there?! Why not create a vision board for your other goals in life unrelated to gymnastics? To make sure she sees her vision board every morning, Liukin keeps the work of art by her vanity mirror: “I think seeing your goals in front of you instead of just remembering them in your mind is a great way to stay motivated, especially on those days you feel like giving up,” she said. Hopefully we’ve convinced you how important it is to create a vision board for your gymnastics goals. 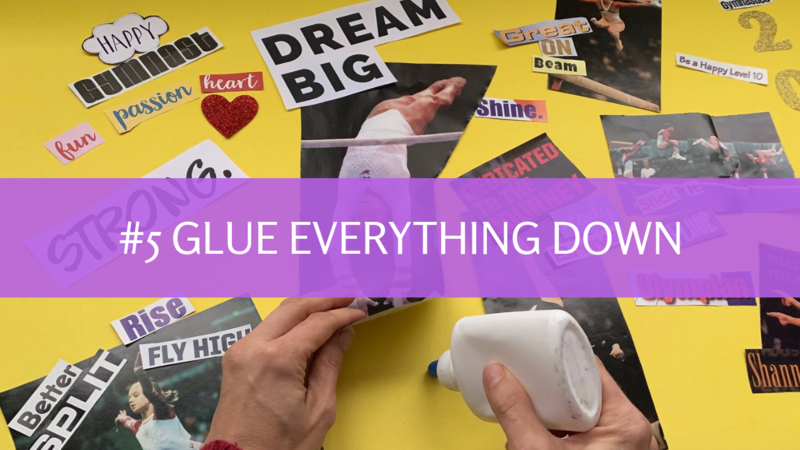 A vision board is an important tool for achieving success in gymnastics and, although relatively simple to create, it’s power is far reaching! When creating your vision board, remember to start by deciding on some goals you want to accomplish this year. Then think about where you’re going to put your vision board which will ultimately help you decide how big to make it. You can then decide which type of paper or board to use. You’ll then gather up all your images and words from magazines or print them out from your computer. Then you’ll lay out all your images and play with the way it looks before gluing everything down. Finally, you’ll put the vision board where you can see it so you can look at it everyday and spend time visualizing your goals! Once you’ve created your vision boards we want to see them in the comments below or tag us on instagram #gymnasticshqvisionboard2019. This is going to be so great to do with my Granddaughters thanks so much. That’s wonderful! We’re so glad you’re going to do this with your granddaughters!